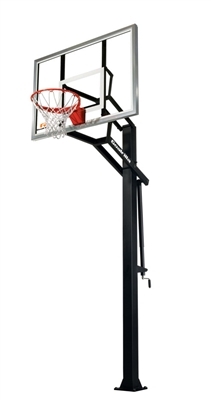 It's one of our compact Goalrilla basketball hoops, but it's big on Goalrilla-tough features. Every Goalrilla is built to bring safety, durability, and arena-quality play to the backyard basketball court. The GSIII delivers with a rock-solid, one-piece 5" x 5" steel pole that supports a 54" x 34" tempered glass backboard. This combination delivers the rebound characteristics found in pro, college and high school arena units. 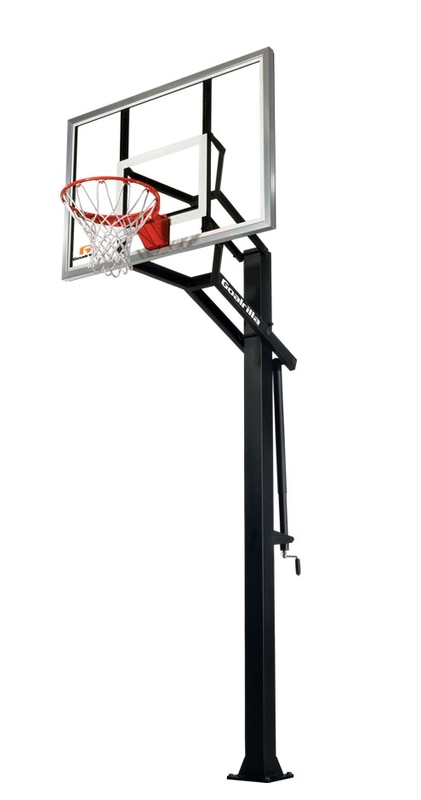 The GS II uses a crank actuator to adjust the goal from the NBA and NCAA regulation height of 10' to safety-approved height of 7.5'. The included pro-style breakaway rim is a spring-activated rim that flexes under pressure, similar to professional-style rims. This basketball goal offers a revolutionary anchor bolt mounting system allowing you the option to unbolt and relocate your system if you move homes. And the GSIII's powder coated finish and corrosion resistant hardware will protect it from the elements so it remains showroom new. Every single Goalrilla unit is built to last and built to play.